St Faith’s is proud to be a Church school and indeed, the Church is at the heart of our ethos here. In the centre of our Atrium is our mosaic of St Faith alongside the prayer box where children are encouraged to become involved and write their own, personal prayers. The children attend Worship every day whether collectively as a school, as part of Singing Worship or in Class Worship. Furthermore, we are fortunate enough to be visited by Father Gordon, the priest at St Anne’s who leads Worship on Tuesdays. Indeed, our school had its own church of St Faith for many years until the Diocese amalgamated with the Parish of St Anne’s. RE is taught for 1 hour and 15 mins every week, and the learning which this brings is often presented to the school by the class in their termly class assembly during Worship on a Friday. 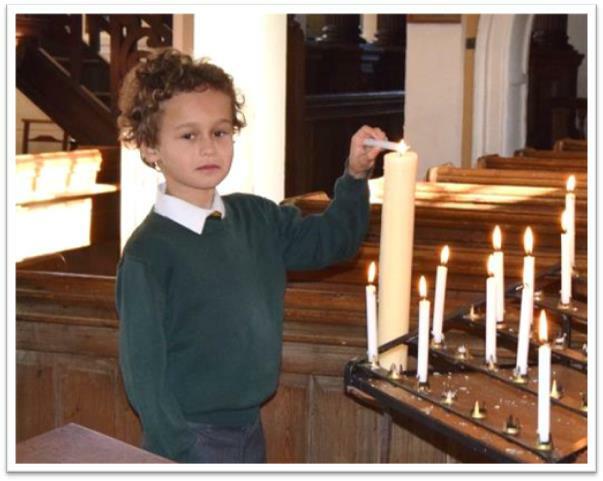 The quality of our RE provision and how the church and its teachings are reflected in our daily lives at school is regularly inspected by the Southwark Diocesan Board. A copy of our recent SIAMS inspection can be read here. Every Christmas and Easter, we enjoy wonderful celebrations and performances undertaken by the children at St Anne’s church – a 15 minute walk away. The church of St Anne’s itself is particularly beautiful and historically important, designed by Robert Smirke, the architect of the British Museum. It was completed in July 1822 and is built from yellow gault bricks with stone dressings and sits behind a giant stone Ionic portico above which a round tower rises from a square base (considered by Pevsner to be “exactly twice as high as it should be”). It is known locally as the Pepper Pot church because of the shape of the tower and is a warmly recognised sight in our Wandsworth skyline. The beauty of the church, its acoustics and feeling of historic reverence encourage a sense of Worship from which the children clearly benefit.